I'm thinking that this kind of building can inspire our World Builders for both building exteriors and interiors in Titan City. However, from a "historical" perspective, I can only imagine a FEW such buildings being in the city, and they would need to be built VERY recently, since this is a NEW construction method (unlike concrete and steel construction). High rises and flammable wood. Not a good combination. Did you watch (and listen) to the first video I linked? Pretty much any high-rise building has to deal with fire and/or structural failure issues no matter what it's made of. If they can come up with ways to create modern skyscrapers with wood I have no problem with it. There are wooden bridges in the world that are hundreds of years old so the material can withstand the test of time if it's used and maintained properly. If nature can manage to grow a giant sequoia tree to be over 300 feet tall then I'm sure we can engineer something taller using that kind of material. Brock Commons (UBC) in Vancouver is built this way. CLT (Cross Laminated Timber) beams and panels and treated so that it doesn't burn. Japan is also planning a Mass Timber skyscraper, it will also have plants growing inside and outside the structure like the Oasia Hotel in Singapore. Can we get some (as in, maybe ... 1-3?) buildings like these in Titan City? Perhaps as (at least) one of the buildings associated with Ephesus University or the NRD? 18 story building ... built in 9.5 weeks. At 3:30 they nod to the danger of fire and say the critical beams are coated and as fireproof as concrete. I'll see if I can find the video. They held a blow torch to the beams for over an hour and all it did was discolour and a tiny wisp of smoke. I mean if there's smoke there's fire....but it could just be the coating combusting. If a building is on fire, you want the building to stay standing long enough to get the people/pets inside of it to safety and evacuated ... and then it can collapse. You run into problems when the building collapses before the evacuation is complete. Now some people will say that buildings ought to be UTTERLY impervious to fire(s) of any size whatsoever, but that's not a realistic (let alone reasonable) expectation or design parameter. That's like expecting cars to be completely uncrushable no matter how much (impact) force gets applied to them. You need a building that is strong and sturdy, sure ... but you also want it to be something that can be evacuated fast enough to empty SAFELY prior to a catastrophic collapse. That way, you don't make the Perfect™ the enemy of the Good Enough™. At the very least I think it would be cool to see a park or public space like Le parc Gardens by the bay. Le parc is a bit tropical but I think you could put a cool spin on it for Northeastern America. I think instead of having palm like shapes they should do giant sized evergreen shapes with tree house style landings. I know one of the moguls will be a modern looking green tower based on concept art from back in the day. All you need is "skyways"
blow torch isnt all that hot. lets see it with a plasma cutter on it. The key point here is if the wooden components of these skyscrapers can "withstand a blow torch for over an hour" that means they'll likely hold long enough for an evacuation in an emergency and it also means this wood-based material is likely at least as durable as traditional skyscraper construction materials. According to Wikipedia, "Plasma cutting is a process that cuts through electrically conductive materials by means of an accelerated jet of hot plasma." I don't think it would work as well on wood... "The basic plasma cutting process involves creating an electrical channel of superheated, electrically ionized gas i.e. plasma from the plasma cutter itself, through the work piece to be cut, thus forming a completed electric circuit back to the plasma cutter via a grounding clamp." Yeah, I'm pretty sure that circuit won't be completed with wood, so it wouldn't heat up the gas. Perhaps you meant an oxy-acetylene torch? Around 3,773 kelvin? I assume the coatings are fairly plasticy and therefore nonconductive. And Wood is largely non-conductive, as well. Unless it gets wet. Even if a plasma cutter could "kind-of, sort-of" work on this type of wood being used in these buildings it's a hypothetical that would be very unlikely to happen IRL anyway. No one is "accidentally" going to try to burn this kind of building down with such a device and if a terrorist wanted to actively destroy such a building they would use a bomb (or admittedly maybe an airplane) to do it, not a plasma cutter. Yours is like saying you could use a hand grenade to blow up a cockroach. Sure that would likely work, but there are more efficient and/or realistic ways to accomplish the same thing without being "exotic" about it. it was only luke warm..
LOL. True, dat. 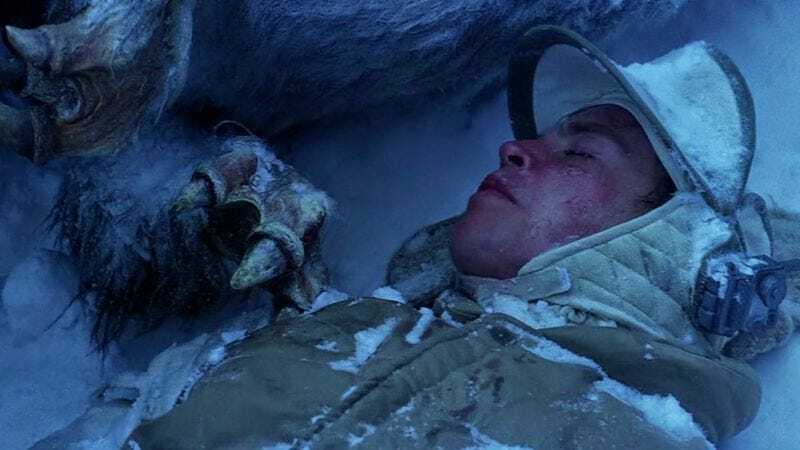 If the tauntaun was a perfect insulator, Luke would've already started recovering from the hypothermia. Han might even have needed to keep the temperature down by letting the cold Hoth air in. Also, we're talking about electrical insulators, not thermal. And yes, wood is very good, as long as it's dry.